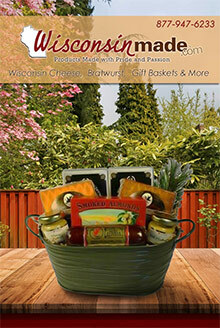 Indulge in a fine assortment of Wisconsin Made catalog favorites, from world famous Wisconsin cheese gifts to bratwurst, gift baskets, apparel, art and more with tempting coupon code discounts. Wisconsin cheese gifts - Celebrate the holidays, a Birthday, Housewarming or a milestone Anniversary with exquisite cheese gift baskets filled with world champion Wisconsin cheese varieties. Wisconsin enjoys a long history as the top quality cheese producing state, so treat them to Wisconsin cheese gift baskets brimming with tasty cheese curds, string cheese, cheddar cheese, goat cheese, cheese spread, havarti and gouda, as well as a carefully selected collection of Wisconsin produced food specialties from chocolate and shortbread cookies to cranberries, Door County cherries, Danish Kringles, ice cream gifts and more gourmet delights. Wisconsin meats - Next to their mouthwatering Wisconsin cheese gifts, Wisconsin Made is celebrated for their outstanding variety of hearty meat gifts to be savored all through the seasons. Sink your teeth into Beer and German bratwurst, beef and pork brats, Nueske meats and sausages from Wisconsin's finest - from grilling sausages for the summer to Bavaria precooked Cajun spicy brats for Green Bay tailgating. Can't decide? Try combo boxes of bratwurst samplers, Wisconsin cheese gifts and sausage assortments so you can sample all of Wisconsin's famous flavors for yourself. Apparel & art gifts - Whether someone is celebrating a Birthday, Anniversary, or any other momentous occasion, WisconsinMade.com offers a delightful selection of apparel and artistic gift options that will please Wisconsin lovers of all ages. Besides their award-winning selection of Wisconsin cheese gifts, you'll also enjoy an assortment of stylish jewelry, handmade pottery, ceramics, paintings and stained glass gifts as well as University of Wisconsin Badger, Brewer and Green Bay Packer clothing for the entire family. Home & garden gifts - Once you've selected your favorite Wisconsin cheeses and meats, explore even more Wisconsin gifts for the home and garden featuring indoor and outdoor decor accents. At WisconsinMade.com, you'll find items to warm every room inside from decorative art to office accessories, as well as gifts to warm up any patio, backyard or garden outside with stepping stones, garden ornaments, planters, bird houses, flowering bulb gifts and gift baskets that are ideal for anyone with a green thumb. WisconsinMade.com features over 3,000 high quality products made with pride and passion by the gifted artisans who reside in the fine state of Wisconsin. Surprise everyone on your gift list with award-winning Wisconsin cheese gifts, brat and sausage samplers, gourmet gift baskets, apparel, artwork and Wisconsin gifts for the home that celebrate and honor the beauty and talent that the Badger State is known for. If you have questions call toll free 1-877-947-6233.